Olympus is a B2B platform, bringing together supply and demand of mobility services, thus enabling mobility packages being assembled effortlessly. Central to this are a mobile app and the Olympus Mobib card. Are you a provider of mobility services such as bike or car sharing, parking spaces, public transport or electric vehicle charging stations? Olympus will help you to reach your B2B customers more efficiently. Are you looking to offer your customers or employees flexible transport solutions - i.e. packages including different mobility services - in collaboration with various mobility suppliers? Olympus will help you to do so in a simple and efficient way. A lot of trips with (company) cars can be done faster and cheaper by public transport or bicycle. Unfortunately it is not always easy to combine different modes of transport. The Olympus platform and its mobile app now change this. 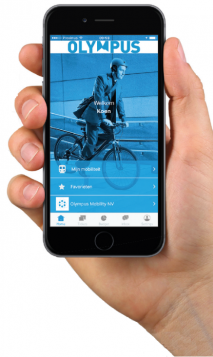 With one press of a button, all mobility solutions are available. Unique in Belgium!